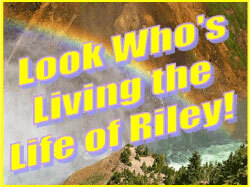 *** WINNERS *** Kimberly, Susan, Toni and Alison are Living the Life of Riley! CONGRATULATIONS! I want to give a big and hearty CONGRATULATIONS to Kimberly, the winner of the Oreck Edge Vacuum from Oreck! Kimberly now has 48 hours to confirm! I currently own a plastic front upright that is chipped and scratched so my favorite feature is the fabric zipper front besides the suction strength. I also want to give a big and hearty CONGRATULATIONS to Susan, the winner of the Gear Ring from Kinekt Design! Susan now has 48 hours to confirm! I also want to give a big and hearty CONGRATULATIONS to Toni, the winner of the Holiday Sweets Gift Basket from Executive Basket! Toni now has 48 hours to confirm! I also want to give a big and hearty CONGRATULATIONS to Alison, the winner of the Large 18" Ladybug Pillow Pet from My Pillow Pets! Alison now has 48 hours to confirm! Liked Pillow Pets on FB! *** WINNERS *** Tawnda, Susan and Heather are Living the Life of Riley! CONGRATULATIONS!